Custom-made soil from Holland. The soil already has a pH of 5.8 and EC value of 1.5 Ec. With this soil there is no need to add nutrients the first 4-6 weeks, depending on the pot size. The soil is premixed with vermeculite and perlite. Special Mix is made from Swedish so-called virgin white turf of high quality. One gram of Special Mix can absorb impressive ten grams of water. The turf is cut into a heavily texture and mixed with only the highest quality Perlite, Swedish clay, lime, minerals and organic nutrients. 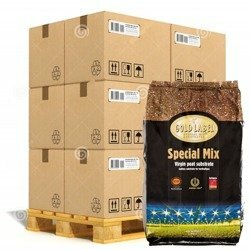 Special Mix is a complete mix ready for use. Because of its unique structure, Special Mix, can be used in 30% drainage system or without any drainage at all. In a system without draining almost nutrients for an entire crop are already there. If you add nutrients, the ideal pH range should be 5.2 to 6.2.